I haven’t gone to see a movie in a very, very long time, but one movie came out early this month, and was a must see. That movie was Bohemian Rhapsody. Die-hard rock n’ roll fans have been salivating over this movie ever since the trailer was released to the public. One of the biggest rock n’ roll fans I know is Elder student Jack “Dutch” Yungbluth, and he has talked to me numerous times about seeing the movie in the future. “I would like to see how they came together and how they made their iconic sound.” said Yungbluth. 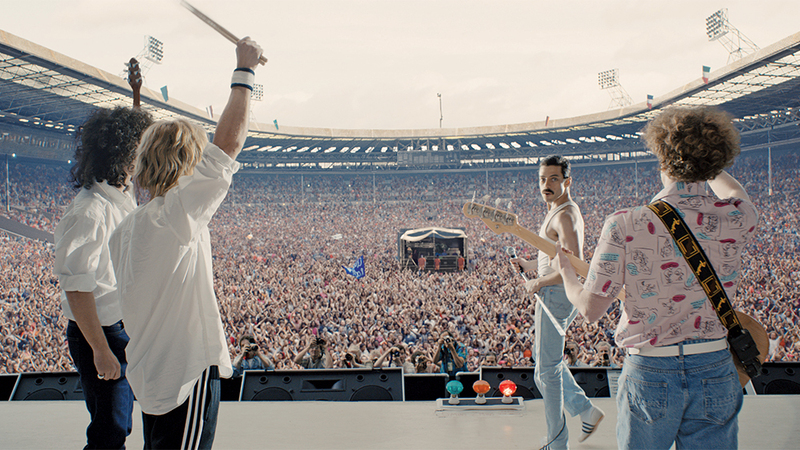 The film is a history of one of the greatest rock bands in the history of music: Queen. The movie depicts many of the monumental events in the bands history, starting at the beginning of the band’s existence, and ending at their famous Live Aid performance at Wembley Stadium. Queen rehearsing in the movie. While the movie provides an accurate depiction on the history of Queen, the film centers on the life of lead singer, Freddie Mercury. Mercury is one of the most attention-grabbing and entertaining artists of all time, due to his wild actions on stage and strange selection of clothing. The film gives a very detailed history of Freddie’s life from the time he joined the band, to his epic performance at Wembley, including everything in between. In my opinion, the filmmakers paid attention to every last detail, making the film seem as if you were watching the band’s actual performance. The actors who portray the band members look, in my opinion, EXACTLY like the real members of Queen. Their attire, speaking voices, and even their actions while on stage “performing” are pretty much identical to the real deal. Even little things like Pepsi cans on the piano and banners in the crowd are noted in the film, things that you would never think are recognized. As I stated before, the actors cannot get any more realistic. A side by side comparison between the film and reality will blow your mind away. The star of the film is Rami Malek, who plays the great Freddie Mercury. Malek had to fake a British accent, and take on a very demanding role of Freddie Mercury, who is pretty much a lunatic on stage. Malek turned out to be a perfect fit for the role, and is an early favorite to win an Oscar for his role as Freddie Mercury. 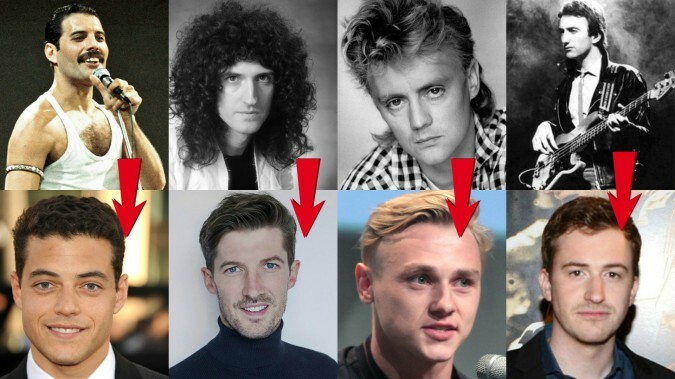 A comparison between the actors (bottom) and the real members of Queen (top). The band members (top) from left to right: Freddie Mercury, Brian May, Roger Taylor, John Deacon. As for some other characters, Gwilym Lee plays the role as guitarist Brian May. Lee looks spot on Brian May, like almost every character, and looks pretty good when playing the guitar. Ben Hardy, acting as drummer Roger Taylor, also looks very realistic. Hardy, like Lee, accurately portrays a skilled drummer. While I know he really isn’t playing the drum, he does a good job in his role. Joseph Mazzello, playing bassist John Deacon, kills this role. Mazzello is the spitting image of John Deacon. It is unbelievable how much these guys look alike. From his hair to his clothing, these guys look identical. Anyway, all four actors mesh together perfectly. They are always in sync, and do a tremendous job of portraying one of the greatest bands in history. The film includes so many aspects of the band’s history and the lives of the band members. The historic Queen music videos are changed so that the actors are in the videos instead of the real members. The outfits that the actors wore on stage and even some casual attire from the actors are exactly the same as real life. The accuracy of the film is what makes it what it is: a masterpiece. So many of Queen’s greatest songs are a part of the film as well. I do not recall not hearing any of the band’s most popular songs, there are 19 total Queen songs included in the film’s soundtrack. Again, this is probably my most anticipated movie in my life so far. This was a must see for me, and it really is a must see for everyone. Whether you are a Queen guy or not, this is a great flick. While in a discussion at the lunch table, junior Justin Schmitt told me he ranks it in his top two all-time greatest movies. Schmitt was not a big fan of Queen until he saw the movie. This just goes to show the effect that Bohemian Rhapsody has on its viewers. As Freddie sings in “We Are The Champions”: “and bad mistakes, I’ve made a few,”, a bad mistake would be not seeing this movie.